The Utah Department of Work Force Services releases data on current jobs and unemployment for the state on a monthly basis. Below is the latest video detailing the most recent employment data for the month of September. The state of Utah stayed at 3.2% unemployment rate ranking below the national average which also held at 3.7%. 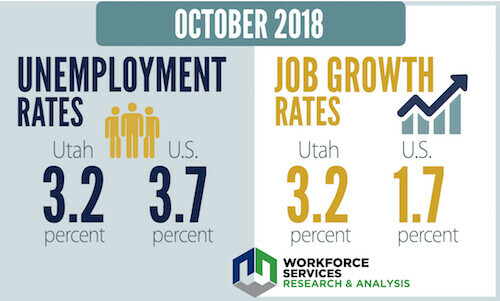 Utah also had 3.2% job growth (compared to October of 2017) rate against the 1.7% national growth rate. Thanks for the input, Aime! To work with Your Employment Solutions, please visit our Request an Employee page. Eric Nelson is the marketing manager at Your Employment Solutions. He likes movies. He loves sushi.